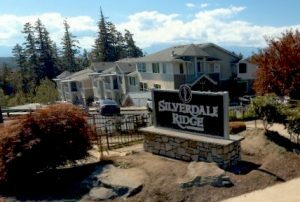 Silverdale Ridge sold on May 26 for $20.05 million. A run on apartment complexes has been one sign of Kitsap’s resurgent rental market. In Silverdale, two Los Angeles-based firms have spent a combined $167 million buying up large apartment complexes in the past year, according to assessor’s records. Most recently, an LLC affiliated with Benedict Canyon Equities bought the Silverdale Ridge Apartments for $20.05 million. Benedict Canyon’s portfolio now includes three complexes in the Ridgetop area. TruAmerica, a separate firm headquartered in the same Los Angeles building as Benedict Canyon, bought the Wellington and Madison at Ridgetop apartments last fall, as part of a 14-property, multi-state deal. 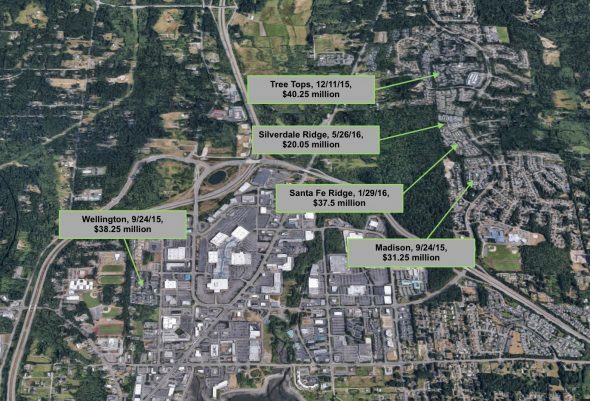 A description of Silverdale on TruAmerica’s website provides insight into why investors are sweet on the area. The description notes the local economy is “driven by retail, health care, and professional military,” and highlights Harrison Medical Center‘s $240 million expansion project. Rents also are improving (from a landlord’s perspective) in the county. In a second quarter market report, Tom Cain of Apartment Insights Washington found Silverdale had the largest average rent increase of any submarket in Kitsap. Click here to read my post on second quarter rental trends in Kitsap.